Glaucous. It means blue-grey. It describes the powdery patina on barely ripened plums and concord grapes; a surface you could etch your name on. When I think of plants with glaucous leaves, the first that leaps to mind is Colorado Blue Spruce. Overused in the midwestern landscape, it has become an object of scorn and derision. Something you wouldn't be caught dead planting in your front yard. A synonym for tacky. Let's not be snobs. I love glaucousness. 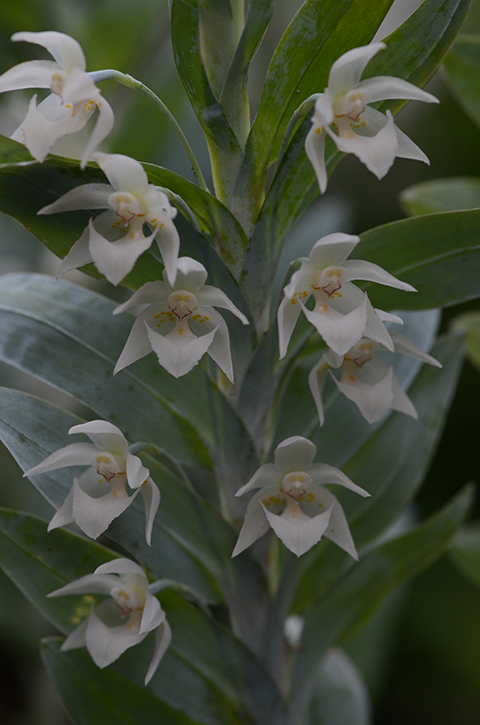 Especially on an orchid as exquisite as Dichaea glauca. The plant, above, is maybe 18" tall (robust for a Dichaea), with a dusting of frost on its blue green leaves. It looks like it belongs in our chilly High Elevation House, though, in fact, it grows at intermediate elevations in nature, from Mexico through Central America, and would grow just as well in a humid greenhouse running coolish intermediate (58º nights) temperatures. Andy Phillips of Andy's Orchids grows magnificent Dichaea glauca plants in his southern California greenhouse. (I have a serious case of climate-envy for greenhouses in that region). In the FOC it loves growing in a mound of live sphagnum with its roots attached to a rocky surface. Our plants are flowering this month in the Tropical High Elevation House.